Have your ever struggled estimating percentage of a large number? Have you ever wondered how some accountants, consultants or engineers calculate complex mathematical operations only mentally in few seconds? 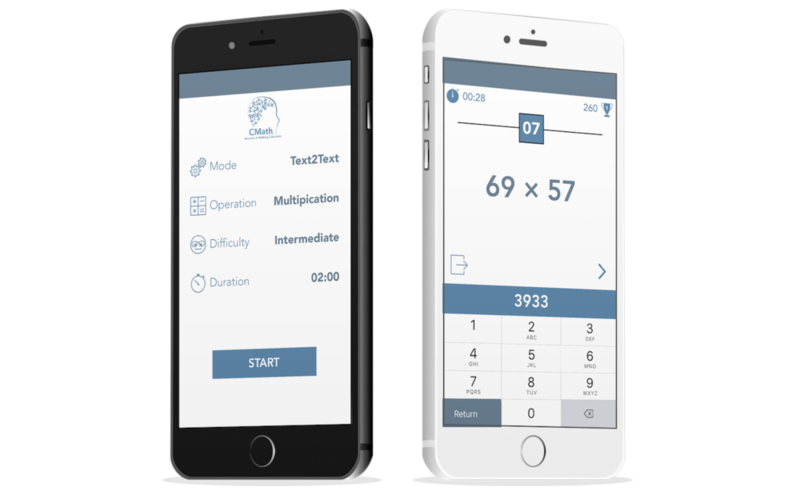 We developed CMath to help you achieve those levels and amaze your friends with your outstanding capability as "Walking Calculator"
CMath design is quite simple. Choose your settings and play! that's it. I will give a quick look at the app below. The landing page of CMath plays as the settings page as well. You can customize it based on your desier. Mode: CMath offers 3 modes. 2- Speech2Text: you hear the operation via voice (just like when Siri talks!) and you would enter the answer via keyboard. Believe it or not, when you do not see the operation on screen it is much harder to answer the questions. This particular mode is good for those users who are trying to prepare themseleves for a practical use of fast mental calculations specifically for consulting jobs or interviews. 3- Speech2Speech: in this mode, you do not even need to type! CMath dictates the operation for you and you answer via your own voice. Speech2Speech mode is tricky though, you need to pronounce the numbers well and quick. Note: I do not recommend using Speech2Speech with complex modes such as hard multiplication or estimation. Operation: You would choose what mathematical operation you want to practice. Summation, subtraction, multiplication, division and percentage are the options plus a random option where for each question it would choose one of the operations. Duration: set the starting duration of the session. You would gain extra time by answering questions quickly. Once you start a practice session in CMath, you would face the question page. Based on your Mode settings, the question page either shows the context of the operation you are asked to answer or it shows a speaker button when CMath is dictating the question for you. Session Timer: on top left of the screen the timer shows how much time remains from your current session. You can gain extra seconds by answering the question quickly before bonus timer runs down. Bonus Timer: the square timer with its two expansion lines, shows the amount of time remaining from your bonus time. Try to answer the questions within the bonus time to gain extra second and boosted score.